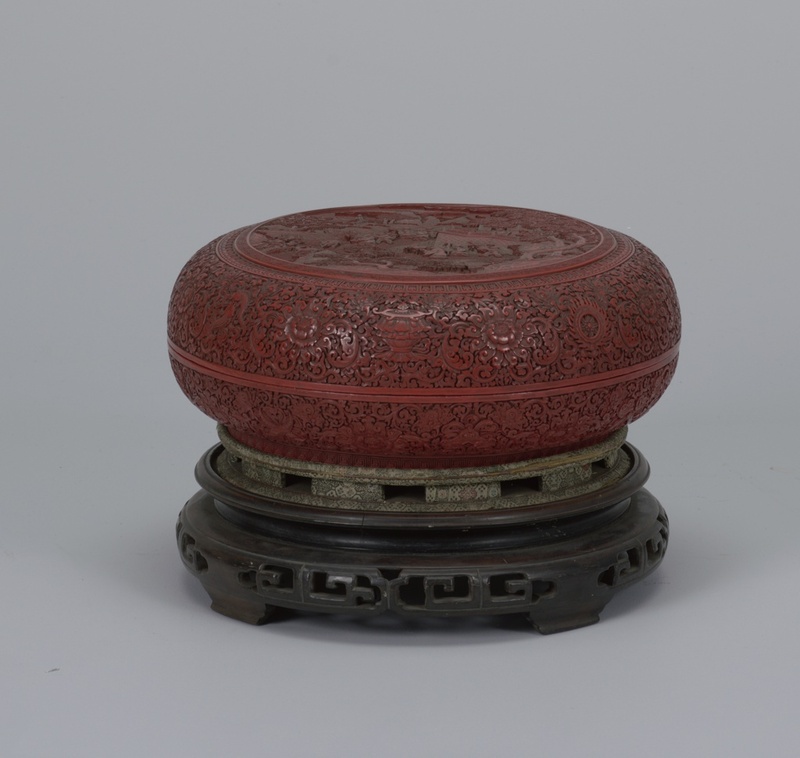 This red lacquer box has a short circular foot and a precisely fitted circular lid. Together these elements combine to present a unified whole. The box rests on a carved wooden stand, its feet embellished with a leiwen pattern, a type of repetitive ornamental design composed of lines winding in S-forms, resembling a Greek key fret. The form’s squared coiled lines represent clouds and rolling thunder, hence it is called the cloud and thunder pattern (yunwen and leiwen), and symbolized life-giving rain and the abundance it brought. The box’s deep red lacquered surface is deeply carved with peony-like flowers that are interspersed with beribboned Buddhist-Taoist symbols set among buds and scrolls. The outside edge is carved with the Eight Auspicious Symbols of Buddhism distributed among flowers and scrolls. The top of the lid features a landscape framed by a band of bud-like forms encircling an inner band of interlocking geometric figures and shou characters which represent longevity. Lacquer is a resin made from the highly toxic sap of a family of trees found in southern China. The liquid from the tree hardens when it is exposed to oxygen and humidity and functions as a natural plastic. The Chinese have been utilizing lacquer since at least the sixth century B.C. There are several methods of using lacquer for decorative adornment. Carved lacquer objects are created by applying multiple thin layers of lacquer onto a substrate (wood in the case of this box) and then carving through the layers. This method is the most laborious and time-consuming of all lacquering techniques. To obtain the characteristic intense red of this carved lacquer, it is tinted with cinnabar, a mercury sulfide mineral compound. It is the only important ore of mercury and is slightly less toxic than mercury itself. Its bright red color has inspired people to use it as a pigment or carve it into jewelry and ornaments for centuries. However, use of this toxic substance as jewelry or a decorative pigment has nearly ceased today. The toxicity of both the resin and its coloring agent made lacquer working quite risky, yet carved lacquer wares were produced by Chinese artisans as well those of other cultures around the world. The intricate beauty of the carvings not only represent the talent of the artist, but also characterize the dedication of a craftsman who is committed to creating objects of beauty from lethal materials.